A method has been devised to quantify the effect of seasonal environmental stress on nutritional well-being and to estimate the proportion of Third World populations at risk of functional deterioration. An Index of Agro-Climatic Seasonality, IACS a measure of potential agricultural biomass availability - has been developed from agro-climatic data. IACS was found to be highly correlated with the seasonal weight loss of adults in rural Third World communities. This relationship was then used to predict the existence and severity of seasonal energy stress incurred by the adult population of Third World countries at any given body mass index (BMI). The average weight loss recorded in all seasonality studies was calculated; this value was used to specify, in combination with BMI, a condition of moderate seasonal energy stress. This grade of energy stress involved a loss of about 2% fat-free mass. The risk of greater energy stress, with larger losses of lean tissue, was specified as severe when predicted weight changes exceeded the maximum losses of weight recorded - at any given BMI - in Third World rural communities. The global dimensions of seasonality were then calculated by enumerating the individuals who - by the combined criteria of the BMI and the IACS of the habitat - fell into the categories of moderate and severe seasonality risk. On this basis, 65% of the rural adult population in the Third World run the risk of at least moderate seasonal energy stress, while 45% fall into the severe stress category. Of these 25% qualify as true seasonal 'casualties' because their body weight loss shifts their BMI from the normal range of nutritional status into the category of chronic energy deficiency. It is widely believed that most rural populations in the Third World suffer from seasonal energy stress because of fluctuations in their access to food, either in absolute terms, such as during the pre-harvest decline in food availability, or in relative terms, because of the increased energy output needed for peak agricultural work (Pacey & Payne, 1985). The exposure to either form of energy stress is considered to be deleterious from the nutritional, and possibly functional, point of view. We have shown in a previous paper that, contrary to this view, exposure to seasonal energy stress is less widespread than expected and seems to cause less severe damage than anticipated (Ferro-Luzzi, Pastore & Sette, 1987). This controversy led us to further analyses and we are now in a position to assess the practical problems of the importance of seasonality to the nutritional well-being of Third World rural populations. 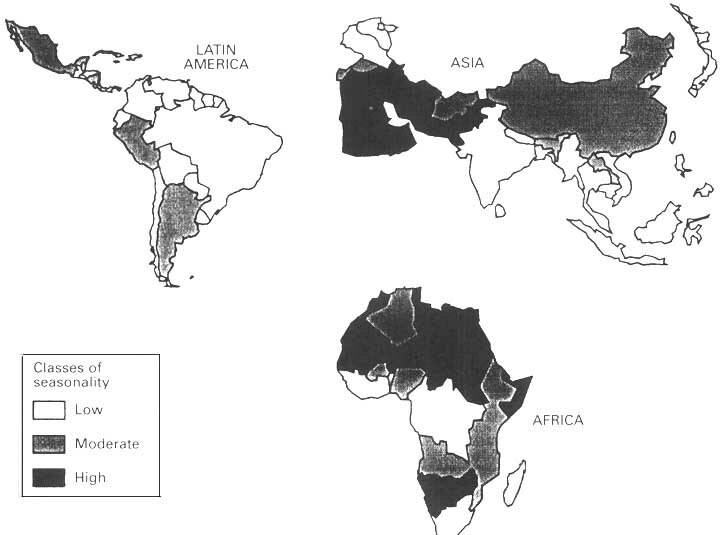 This paper develops further an earlier method for identifying the potentially vulnerable populations in the Third World (Ferro-Luzzi & Branca, 1993) and applies it to other countries where the requisite data are available. An estimate of the world population at risk for seasonal energy stress is then given. The first step involved defining the 'seasonal habitat'. Rural communities rely to a large extent on the annual production of biomass, either for their own direct consumption or as fodder for their livestock. Thus, to cause seasonal energy stress to the resident population, the climatic and environmental conditions must meet certain requirements in terms of rainfall and the water retention capacity of the soil. Both of these profoundly affect the vegetative cycle and therefore biomass production. Agronomists have traditionally calculated the potential evapo-transpiration (PET) of the soil by combining environmental and climatic data (total radiation, water pressure, wind, temperature, altitude and latitude) (Walsh, 1981). PET is a measure of the water needs of the soil for sustaining vegetal growth. By subtracting PET from actual rainfall (plus any other available source of water), a water balance is obtained taking into account the water-retention capacity of the soil. Plant growth is possible only when water availability is >0.5 PET, i.e. on 'intermediate' days, and becomes optimal when the water balance is positive, i.e. on 'wet' days. We have therefore improved the PET index by calculating the length of time over which the water budget is capable of supporting the vegetative cycle. This new index, which reflects the potential for the production of biomass, we have called the index of agro-climatic seasonality (IACS). This index is an improvement over our earlier attempt (climatic seasonality index, CSI) which did not take into consideration either the water retention capacity of the soil or other relevant meteorological variables (Ferro-Luzzi et al., 1987). The IACS varies from 0, when there is no seasonality with plants growing all the year round, to I which corresponds to 365 dry days per year, i.e. when no growth is possible. An example of how the IACS differs and improves the previously suggested index is illustrated by the case of Kenya. Kenya has a CSI of 0.79 which classifies this country as highly seasonal. However, when the timing of the two rainy seasons is taken in combination with the moisture retention characteristics of the soil, conditions supportive of a prolonged vegetative cycle are revealed. Biomass is in fact produced in Kenya over a longer period of time than anticipated by the CSI. The IACS then correctly classifies Kenya in the moderately seasonal category. We calculated the IACSs of all Third World countries using the information derived from local stations in each country and collated by FAO (FAO, 1984 a, b, 1985, 1987 a, b). The IACSs are given in the Appendix. For simplicity, the data from multiple local stations were averaged at the country level. This practical approach does, of course, obscure within-country differences. We have then created four classes of seasonality, on the basis of the length of the vegetative cycle of maize (90 and 120 days for the early and the late maturing varieties, respectively). Maize is an arbitrary choice and any other more locally relevant food crop could be adopted. An IACS ranging between 0.00 and 0.44 was taken to denote 'low seasonality'. This allows a vegetative season of >200 days per year, and thus supports more than two harvests. At IACSs between 0.45 and 0.65, the vegetative period lasts between 120 and 200 days and one to two cycles of maize may reach full maturation; this was classified as 'moderate seasonality'. 'Severe seasonality' was said to occur when IACSs ranged between 0.66 and 0.80. The vegetative period is then <120 days and one maize cycle is barely possible. The desert habitat has an IACS >0.80, and is incapable of supporting rain-fed agriculture. Normally, only small nomadic groups of pastoralists live in these areas. Before adopting this index, its reliability was tested against an independent indicator of human biological stress. To do this, the study areas' IACSs were regressed against the body weight loss recorded in longitudinal studies conducted in rural areas of the Third World. The results were very encouraging as a correlation coefficient of 0.67 was obtained for males and 0.65 for females, thus explaining almost 45% of the variance of weight loss. The two linear regressions are shown in Fig. 1. Three outliers shown in Fig. 1 have not been included in the regression. Two of the three are represented by Masai men and women, whose data were collected in a year of severe drought (De Garine & Koppert, 1988). The other group is represented by pregnant Gambian women studied by Lawrence et al. (1989); their seasonal weight loss had been estimated from regression equations, controlling for the stage of pregnancy, and weight loss may have been overestimated. The prediction of seasonal weight loss from IACS might be further improved by adding BMI as independent variable. The best results, with up to 85-90% of the variance explained, are obtained when meteorological variables, such as mean, minimum and maximum temperature, water pressure, wind, sunshine and total radiation are entered separately in a multiple regression equation. Fig.1. Linear regressions between IACS and seasonal body weight loss of communities of Developing Countries. The triangles represent three outliers not included in the regression (see text). Males: delta body weight (kg) = 0.56 + 2.89 IACS, r = 0.67, P < 0.001. Females: delta body weight (kg) = 0.48 + 2.22 IACS, r = 0.65, P < 0.001. Ba = Bangladesh (Abdullah & Wheeler, 1985; Chen et al., 1979), Be = Benin (Schultink et a/., 1990; DANA, 1991), BE = Burkina Faso (Bleiberg et al., 1980; Brun et al., 1981), Bo = Botswana (Wilmsen, 1978), Bu = Burma (Tin-May-Than & Ba-Aye, 1985), C = Cameroon (De Garine & Koppert, 1988), Cd = Cameroon during drought (De Garine & Koppert, 1988), E = Ethiopia (Ferro-Luzzi et al., 1990; Branca et al, 1993), G = Gambia (Lawrence et al., 1989; Prentice et al., 1981), K = Kenya (Little et al, 1986; Cogill, 1987),1 = India (Norgan et al., 1993; Durnin et al., 1990), M = Mali (Benefice et al., 1984), N = Niger (Loutan & Lamotte, 1984), P = Papua (Spencer & Heywood, 1983; Crittenden et al, 1986), S = Senegal (Benefice & Chevassus-Agnes, 1985; Rosetta, 1986; Gessain, 1978), Z = Zaire (Pagezy, 1982; Bailey & Peacock, 1988). Exposure to uncertain food supplies whether regularly recurring (as in the pre-harvest scarcity of food) or under exceptional circumstances (as in drought-associated famines) is likely to have confronted the human race throughout history. A range of remedial responses has therefore evolved. The first to appear are avoidance strategies which prevent biological damage to children and adults. By definition, avoidance strategies are of a socio-economic and cultural nature and have been beautifully described by Bayliss-Smith (1990) and Thomas & Leatherman (1990). These strategies include the choice of cropping patterns, the sale of assets, the establishment of mutual support groups and the diversification of income from off-farm sources. When avoidance strategies fail, coping mechanisms of a behavioural, ergonomic and metabolic nature come into operation. The earliest sign of this switch from avoidance to coping is represented by the fall of body weight, reflecting the negative energy balance of the exposed individuals and communities. It would be wrong to claim that all weight losses recorded in rural areas of developing countries are caused by seasonal cycles in biomass available. The picture at the microscale is much more complex and many other factors should be taken into account, some with short-term effects such as seasonal epidemics of disease, others with non-seasonal effects, e.g. guerrilla warfare, ecosystem degradation and pest attack on food crops. Weight loss recorded in areas where there is no, or only very low, seasonality (IACS <0.40) may provide a signal of the cumulative effect of factors unrelated to biomass availability. We found that men's body weight dropped by 1.5 kg and women's by 1.2 kg in 13 groups living in low seasonality areas. Therefore, only weight lost in excess of this baseline should be attributed to agro-climatic seasonality. Thus, in a country with an IACS of 0.50 and a total weight loss recorded of 2 kg in men and 1.6 kg in women, strictly speaking only the loss of 0.5 kg in men and 0.4 kg in women should be attributed to agro-climatic cycling of food resources. In practice, given the great difficulty in separating the different effects, we decided to disregard this distinction and to predict the total expected weight loss at any IACS value, based on the two regression equations reported in Fig. 1. In assessing the biological implications of this weight loss, it is important to remember that loss of any weight includes both fat and lean tissue. Lean tissue is removed from what is known as a labile pool, including liver and gut proteins as well as muscle tissue. The rate at which lean tissue is wasted depends on the extent of the energy deficit and on the adequacy of dietary protein intake (Munro, 1964), as well as on the size of the body fat stores at the outset (Forbes, 1987). Thin people have a smaller labile nitrogen pool than the obese, and the half-life of their total body nitrogen is shorter: the first 1% is lost with a half-time of 2.4 days and the remaining 99% with a half-time of 116 days, while in the obese 6% is lost with a half-time of 10.6 days and the remainder with a half-time of 433 days (Forbes & Drenick, 1979). Functional impairment is thus likely to occur earlier in thinner people. Figure 2 is a modified version of the figure proposed by Forbes (1987) relating the proportion of lean tissue loss to the fat mass of the individual at the beginning of the weight loss period. In Fig. 2, the BMI corresponding to the fat mass was calculated by applying the equation developed by Norgan & Ferro-Luzzi (1982) on a group of Italian shipyard workers for BMI >20 [BMI = (25.8 + fat mass [kg])/1.725] and by applying an equation developed from Ethiopian men for BMI <20 (Branca, Ferro-Luzzi & Pastore, unpublished data) [BMI = (11.12 + fat mass [kg])/0.943]. The dots on the chart are mean values of groups of weight-losing obese patients or normal subjects, and the triangles represent weight-gaining anorectic or normal subjects. A few more studies have been added to the original set analysed by Forbes (Hermelo et al., 1987; Van Dale et al., 1987; Van Loan et al., 1987; Kushner & Haas, 1988; Vaisman et al., 1988; Duerenberg, Westrate & Hautvast, 1989; Jebb et al., 1991; Moore, Oddou & Leklem, 1991). The line is the theoretical exponential calculated by Forbes (1987) from his own underfeeding and overfeeding experiments, and is a reasonably good fit also for the data obtained from the other studies. The curve increases very steeply to remarkably high proportions of FFM (fat free mass) loss at values of BMI <21-22. In other words, the weight lost by an obese individual with a BMI of 40 includes only �20% of lean tissue, while at a BMI of 21, lean tissue accounts for 50% of the weight lost, and up to 70% at a BMI of =<17. Based on this relationship, we have calculated the threshold that should not be exceeded by weight loss at each BMI if the percentage loss of lean tissue is to be limited to a specified level. Figure 3 shows the proportion of lean tissue lost for any given combination of weight loss and initial BMI. The lines have been drawn by first calculating the fat mass corresponding to each BMI, on the basis of appropriate regression equations (Norgan & Ferro-Luzzi, 1982; Branca, Pastore & Ferro-Luzzi, unpublished data). Fat-free mass has been estimated by difference assuming a stature of 1.7 m. Forbes' equation was then used to obtain the proportion of fat-free mass that would be lost in conditions of prolonged negative energy balance at any given BMI. Finally, we have calculated the weight loss required to produce a 1%, 2%, 3% and 4% loss of body fat-free mass at any given BMI. It can be seen that to keep the depletion of fat-free mass within 1%, body weight loss must not exceed 0.6 kg at BMI 17, while it could go up to almost 1 kg at BMI 20. If a person with BMI 17 were to lose 2.4 kg body weight, he would lose 4% of his fat-free mass. This corresponds, in a man of 1.7 m height, to 1750 g tissue. Fig. 2. Proportion of weight loss (or gain) represented by fat free tissue according to body mass index (BMI) value at the beginning of the weight loss (or gain) period. Transformed from Forbes (1987). F = Forbes data, see text for other points. Fig. 3. Proportion of fat-free mass (FFM) lost for any given combination of weight loss and initial body mass index (BMI). What are the implications of these observations for the Third World farmer? The order of magnitude of seasonal weight loss observed in most communities is rather modest. Figure 4 collates all evidence available to date (Ferro-Luzzi & Branca, 1993), presented in terms of units of BMI change. The seasonal drop in BMI is on average < 1 unit of BMI, and only in exceptional cases does it approach 2 units. Thus, unless due consideration is given to the additional threat posed by the associated loss of lean tissue, it would be tempting to discard seasonal weight loss as being of little physiological significance. However, adults living in rural areas of the Third World tend to have BMI values at the very low end of the distribution of BMIs seen in Western societies. This places them in a precarious position and provides good reasons for suspecting that even a modest seasonal weight loss might have undesirable nutritional and functional implications. Fig. 4. Magnitude of seasonal BMI changes observed in communities of Developing Countries. References: Be = Benin (Schultink et al., 1990; DANA, 1991), BF = Burkina Faso (Bleiberg et al., 1980; Brun et al., 1981), Bo = Botswana (Wilmsen, 1978), Bu = Burma (Tin-May-Than & Ba-Aye, 1985), C = Cameroon (De Garine & Koppert, 1988)), E = Ethiopia (Ferro-Luzzi et al., 1990; Branca et al., 1993), G = Gambia (Lawrence et al., 1989), K = Kenya (Little & Johnson, 1986; Cogill, 1987), I = India (McNeil! et al., 1988; Dumin et al., 1990; Norgan et al., 1993), M = Mali (Benefice et al., 1984; Hildebrand, 1985), N = Nigeria (Loutan et al., 1984), Pa = Papua (Spencer & Heywood, 1983), Pe = Peru (Leonard, 1989), S = Senegal (Gessain, 1978; Benefice & Chevassus-Agnes, 1985; Rosetta, 1986), Za = Zambia (Kumar, 1987), Zr = Zaire (Pagezy, 1982; Bailey & Peacock, 1988). In order to assess the danger associated with the weight loss recorded under real life conditions, mean seasonal weight loss was regressed against mean BMI (Fig. 5). The points correspond to the rural communities identified in the legend to Fig. 1. Inspection of this graph reveals that Third World farmers tend, on average, to limit the depletion of their fat-free mass to <2%. Moreover, it may be seen that groups with a smaller BMI tend to lose less weight in absolute terms than people with a higher BMI. This cross-country observation is consistent with earlier within-country observations that the thinner people within a Third World community exhibit smaller seasonal weight losses (Ferro-Luzzi & Branca, 1993). This resistance to mobilizing body reserves may be seen teleologically as the avoidance of depletion of the important and scarce lean tissues, thereby safeguarding the functional integrity of the body. Obviously, this can happen only if physical activity is sacrificed in order to save energy. The long-term implications of this form of energy saving are not known, but are likely to be highly detrimental to long-term survival. The regression line in Fig. 5a is drawn from all the points and is taken to represent the limit of 'safe' seasonal fluctuation, i.e. one that causes the minimal depletion of valuable lean tissue (i.e. less than 2%). With this loss there is a low risk of inducing functional and nutritional deterioration. This line is called the 'average stress line'. Fig. 5. Linear regressions between mean seasonal weight loss and mean BMI in those Third World rural communities shown in Fig. 1. a: average stress line, drawn on all communities. b: maximum stress line, drawn on the groups with the greatest weight loss at each BMI (shown as solid circles). Maximum stress line: males: weight loss (kg)=0.62* BMI- 10.1; females: weight loss (kg) = 0.62* BMI - 10.4. However, the scatter of the individual points indicates that several communities have survived with weight losses much greater than the average. This observation induced us to develop a second, less conservative, choice of cut-off point from biologically important weight loss. The regression line in Fig. 5b has been drawn only from those groups who had the greatest weight loss at each BMI level. We have called this line the 'maximum stress line', reasoning that it would set the upper consented limit for mean weight loss within a community. Beyond this value severe deterioration in nutrition and function would certainly occur. The maximum stress line is seen to rise very steeply, cutting across the % fat-free mass lines in rapid sequence. This suggests that weight losses >1.5 kg may be safely tolerated only at BMIs >19. To sustain without excessive risk a weight loss of 3 kg and limit the lean body mass loss to within 3%, it is necessary to start by having a BMI >21. A crude attempt to calculate the dimensions of the seasonality risk in the world had been made earlier (Ferro-Luzzi & Branca, 1993). Having developed more coherent agricultural and nutritional analyses it is now possible to refine the original calculation. The world distribution of agro-climatic seasonality is given in Fig. 6, drawn on the basis of the countries' IACS. It shows that there are vast areas with severe agroclimatic seasonality in Africa, only some in Asia, and none in South America. The total adult rural population living in areas of moderate and severe seasonality was then calculated from UN data (UN, 1980). Fig. 6. The distribution of agro-climatic seasonality in Asia, Africa and Latin America. The classes of seasonality are based on IACS intervals. Low seasonality: IACS <0.45; moderate seasonality: IACS 20.45 and <0.65; high seasonality: IACS >0.65. Table 1 shows that in 1980 one and a quarter billion adults lived in rural areas of the Third World (UN, 1986, 1991), 75% of whom (924 million) inhabited areas of moderate and severe seasonality. The next step in the quantification of the seasonal risk consisted in identifying the subjects at risk on the basis of the combined criteria of BMI and IACS. We first predicted the average seasonal weight loss that men and women are likely to experience in low-income countries worldwide, based on the IACS values provided in the Appendix and the regression equations given in the legend to Fig. 1. We have then defined the BMIs below which men and women would be exposed, for any given weight loss, to an average or a maximum risk of functional impairment, based on the 'average' and 'maximum stress' lines described above. Thus, the BMI cut-off points for average risk were calculated as BMI = (3.54 + weight loss [kg])/ 0.27 for men, and BMI = (1.55 + weight loss [kg])/0.55 for women. The BMI cut-off point for severe risk was calculated as BMI = (10.1 + weight loss [kg])/0.62 for males and BMI = (10.4 + weight loss [kg])/0.62 for females. We have then computed the proportion of rural adult population living in low income countries whose BMI falls below the threshold for average and maximum risk. This step requires population-representative data on BMI distribution. While the forthcoming adoption of BMI as indicator of adult CED by FAO (James & Shetty, 1993) and WHO is likely to generate in the near future substantial new information on population-representative distributions of BMI, the current scarcity of these data greatly hampers this step of the exercise. The major sources used in this paper have been the recent review by James & Shetty (1993) and the monograph by Eveleth & Tanner (1991). A 10% coefficient of variation of population BMI was assumed to exist when the standard deviation was not available. Other data sets were also available to us, collected in Ethiopia (Branca et al., 1993; Ferro-Luzzi et al., unpublished), India (Norgan et al., 1993), Zimbabwe (Ferro-Luzzi & Pastore, unpublished data), and Senegal (Branca et al., unpublished data). Using tables of the normal distribution, we have calculated the proportion of individuals in each population falling below the BMI cutoff points for average and maximum risk. Table 2 gives the total adult population exposed to seasonal stress and the number of people who, on the basis of the combined criteria of BMI and IACS, are at moderate risk, i.e. are likely to experience weight changes involving a loss of fat free mass >2%, but smaller than that defined by the 'maximum stress line'. The third column gives the number of people whose seasonal weight changes are likely to exceed the 'maximum stress line' and should therefore be considered at severe risk of nutritional, metabolic and functional deterioration. aThe enumeration is related only to countries for which the mean body mass index of the population is available (917/1223 millions). Focusing on the severe risk column, it appears that there are altogether 408 million adults at risk. As for the distribution of the seasonal energy stress, although most of the high IACS areas are in Africa, the largest number of people at risk (371 million people) are to be found in Asia. This is due to the unique combination of low BMI and a very large rural population. Thirty-three million people are at risk in Africa and a negligible 4 million people in South and Central America. In considering that 408 million people are exposed to the severe risk of seasonality, it is necessary to bear in mind that they include 129 million whose BMI, even after the seasonal shift of their body weight, still remains above the cut-off point for CED (BMI 218.5) and thus would not, strictly speaking, be classified as malnourished. These subjects may nevertheless run the danger of shedding, with their substantial seasonal body weight loss, an undesirably high proportion of their valuable fat-free mass. Another 180 million are classifiable as CED (BMI <18.5) independently of their exposure to seasonal energy stress. This pre-existing malnourished group greatly inflates the size of the seasonality problem on a global basis but it would be incorrect to deduct their number from the total population at risk. In fact many of these people live in regions with agro-climatic seasonality, so their state of malnutrition is seasonally compounded by extra functional and organic deterioration. The remaining 99 million, are those who, well nourished before exposure, i.e. with a BMI >=18.5, seasonally shift their BMI to values below the cut-off point for CED. Whatever the actual number of people at risk, currently the phenomenon of seasonal nutritional stress tends to attract little attention and only when it leads to headline news with such outcomes as widespread death. Neglected is the fact that modest, recurrent, seasonal losses of fat-free mass may also induce in the long term a deterioration in nutritional status. This may well play a major role in increasing the population's susceptibility to infections and impairing their capacity to withstand strenuous physical activity. Both of these features are critical for the survival and success of those living in the rural Third World. Little research has been so far conducted on the harmful functional correlates of low BMI in adults (Little & Johnson, 1986; Othsuka et al., 1987; Kulkarni & Shetty, 1992). Even less, and often conflicting, evidence exists to document the long-term outcome of repeated shifting between a marginal and a low BMI (Ferro-Luzzi et al., 1990; Durnin, Drummond & Satyanarayana, 1990; Schultink et al., 1990). It is also important to appreciate that the effects of nutritional deterioration experienced by adults and their impaired capacity for work affects the children in their care. The affected households then enter a vicious intergenerational cycle of cascading physical and social destitution. More specifically designed research is warranted to support the proposition of this paper that a large proportion of Third World rurals may be paying an unacceptable cost for their exposure to seasonal energy stress. Regrettably, such corroborating studies are unlikely to be performed because, as Bayliss-Smith (1990) points out '... under famine conditions research is often considered a luxury... Yet in a pre-famine situation there is no pressure to collect information because there is no emergency'. Acknowledgements - Thanks go to Ms Stefania Sette and Ms Elisabetta Toti for computing and data management, and to Ms Patrizia Ferranti for secretarial assistance. This work was supported by the National Research Council (CNR) Targeted Project 'Prevention and Control Disease Factors', Subproject 'Nutrition' no. 91.00281.PF 41.